Lazarus had quickly made himself a home in this new place. For a little over a week now, he lived in the frigid snows and tranced along icy streams. Despite the snow and cold, there seemed to be plenty of food around in the form of rabbits and he was resourceful enough to keep himself fed and even have a small stockpile of food and pelts hidden within the twisted roots of his temporary den. Sure it was no pride, but Lazarus was quite proud of his ability thus far to provide for himself with nothing but the land. Truth be told, he was starting to think he didn't need a pride at all. Already he had explored the vast cavern in which he resided and already he had explored the nearby streams until he found one that still had some water too fast to have totally frozen over. He visited that spot often, lapping up drinks or sometimes just eating the snow that lay about. Itching for excitement, Lazarus decides today he is going to venture further. He missed the salty spray of the sea that had been so strong in his homeland, maybe he could find a coastline today. So he sets out westward with broad confident steps, looking as though he surely knew where he was going (he didn't). The pallid young lioness ventured a bit away from her home to explore. With Fwen nestled into the neck fur of the Iqniq's girl, the bat was warm. Nóirín bounced around as some areas of her path had higher snow than other areas. She didn't mind it as she was built warmly with thicker fur for the winter. Blending into the snow, only real ability to be seen was when her ginger stockings were popping out of the fluff on the ground. 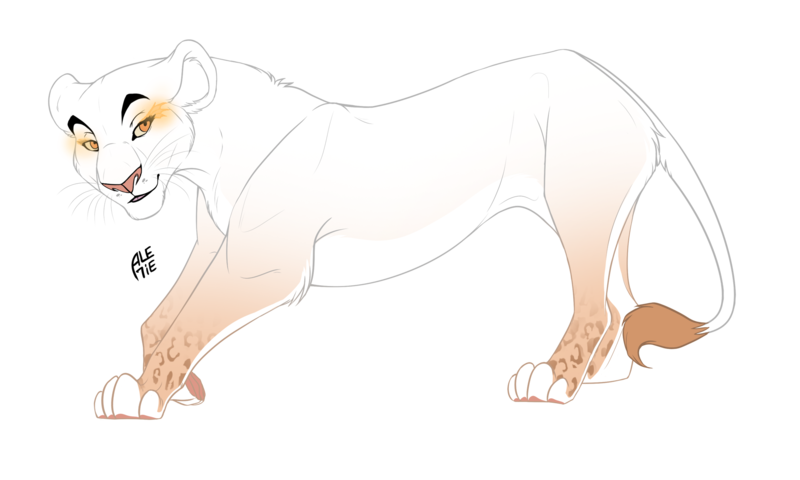 Her shiny markings near her eyes sometimes gave the appearance of the sun hitting the ground. After a while, Nóirín came up to the Savanna and this strange tree caused her to stop and tilt her head slightly. Laughing at the funny roots, she ventured closer before seeing a figure up ahead. Stopping again, she didn't quite know how to approach. Clearing her throat, she was still several lion's lengths away from him. Just in case he was a rude lion. Nóirín's Companion is a Dwarf Epauletted Fruit Bat named Fwen. The soft sounds of a cleared throat catches Lazarus' attention, and he turns to see the girl - about his age - standing just a bit away from him. Black lips curl into a smile, pink eyes assessing her small figure. "Hey, I didn't see you there." He greets, ineffectually flicking his mane out of his eyes. "You blend right in like all these blasted bunnies." He laughs at his own wit, gesturing about as if there were rabbits springing from every crevice in the snow. To be honest, he wasn't too far off. He waits for her to say what she stopped him for, wondering if she needed help in some way. At the sound of her cleared throat, the strange lion turned to her. His mention of her looking like a rabbit made her ears fold back against her skull. Kohana had been a very special hare, and it still hurt her heart. But she knew that hunting animals that were similar to companions would still happen. Raising back up her ears, she clicked her tongue. Where are you from? The girl had only recently started to really explore the lands and still didn't know who was where and what prides lived around. Fwen watched the pair from her cozy spot in her Bonded's neck fur, but didn't crawl out from her spot.